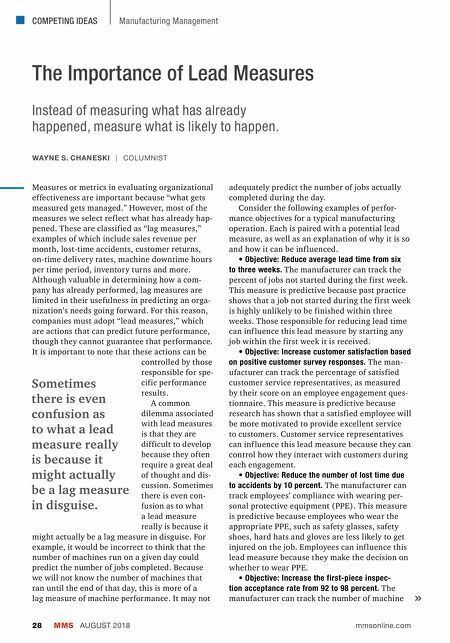 COMPETING IDEAS MMS AUGUST 2018 28 mmsonline.com Manufacturing Management The Importance of Lead Measures WAYNE S. CHANESKI | COLUMNIST Instead of measuring what has already happened, measure what is likely to happen. Measures or metrics in evaluating organizational effectiveness are important because "what gets measured gets managed." However, most of the measures we select ref lect what has already hap- pened. These are classified as "lag measures," examples of which include sales revenue per month, lost-time accidents, customer returns, on-time delivery rates, machine downtime hours per time period, inventory turns and more. Although valuable in determining how a com- pany has already performed, lag measures are limited in their usefulness in predicting an orga- nization's needs going forward. For this reason, companies must adopt "lead measures," which are actions that can predict future performance, though they cannot guarantee that performance. It is important to note that these actions can be controlled by those responsible for spe- cific performance results. A common dilemma associated with lead measures is that they are difficult to develop because they often require a great deal of thought and dis- cussion. Sometimes there is even con- fusion as to what a lead measure really is because it might actually be a lag measure in disguise. For example, it would be incorrect to think that the number of machines run on a given day could predict the number of jobs completed. Because we will not know the number of machines that ran until the end of that day, this is more of a lag measure of machine performance. It may not adequately predict the number of jobs actually completed during the day. Consider the following examples of perfor- mance objectives for a typical manufacturing operation. Each is paired with a potential lead measure, as well as an explanation of why it is so and how it can be inf luenced. • Objective: Reduce average lead time from six to three weeks. The manufacturer can track the percent of jobs not started during the first week. This measure is predictive because past practice shows that a job not started during the first week is highly unlikely to be finished within three weeks. Those responsible for reducing lead time can inf luence this lead measure by starting any job within the first week it is received. • Objective: Increase customer satisfaction based on positive customer survey responses. The man- ufacturer can track the percentage of satisfied customer ser vice representatives, as measured by their score on an employee engagement ques- tionnaire. This measure is predictive because research has shown that a satisfied employee will be more motivated to provide excellent ser vice to customers. Customer ser vice representatives can inf luence this lead measure because they can control how they interact with customers during each engagement. • Objective: Reduce the number of lost time due to accidents by 10 percent. The manufacturer can track employees' compliance with wearing per- sonal protective equipment (PPE). This measure is predictive because employees who wear the appropriate PPE, such as safety glasses, safety shoes, hard hats and gloves are less likely to get injured on the job. Employees can inf luence this lead measure because they make the decision on whether to wear PPE. 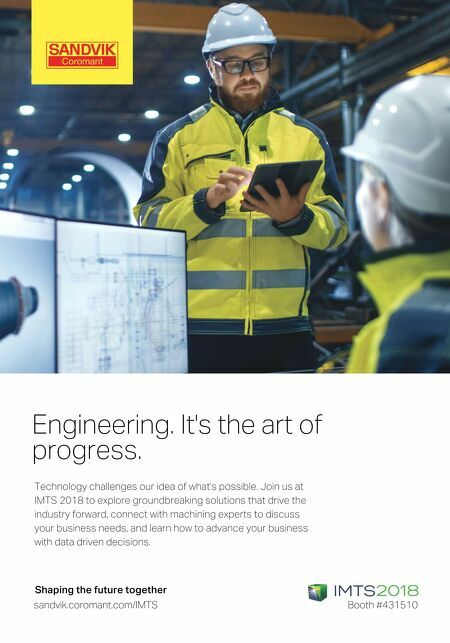 • Objective: Increase the first-piece inspec- tion acceptance rate from 92 to 98 percent. The manufacturer can track the number of machine Sometimes there is even confusion as to what a lead measure really is because it might actually be a lag measure in disguise.